Choosing Wisely is an initiative of the ABIM Foundation that seeks to advance a national dialogue on avoiding unnecessary medical tests, treatments and procedures. Read more about the campaign. Get the Choosing Wisely app! Download the new Choosing Wisely app to your iPhone/iPad or Android device and have over 540 specialty society recommendations and 150 patient-friendly resources at your fingertips. Browse downloadable resources that clinicians can place in waiting or exam rooms, or give to patients as handouts to educate them about overuse. Materials are available in both English and Spanish. 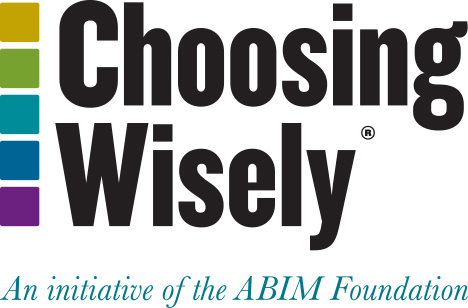 Follow #ChoosingWisely on the ABIM Foundation’s Twitter and Facebook pages.